On June 1 and 2, the 5th game of 64th Meijin-sen between Meijin Moriuchi and Challenger Tanigawa was held in Gunma prefecture, Japan. 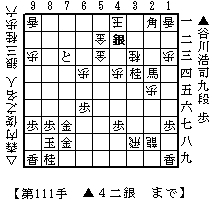 Tanigawa played Sente(Black) and he won the game with 111 moves. The score after the game is 3-2 led by Meijin Moriuchi. The 6th game will be held on June 15 and 16. It will certainly be a big game to both players.